Many of you will have seen the plans for the proposed building works displayed at the back of the church and around the village. While this is a beautiful church in a stunning setting, it would benefit enormously from certain enhancements. Central to all of this is the fact that there is currently no water supply to the church which means there can be no lavatory or washing up facilities. As the church attracts more and more people, either through more events such as weddings and concerts, increased flow of visitors from around the world or simply a growing congregation, we will increasingly feel the lack of these facilities. In addition, we have a thriving Sunday school at our services which currently has to camp in the bell tower with only a curtain for noise insulation. While the children are well-behaved, they are inevitably heard by the congregation during services. The children, aware of this, are forced to curb their enthusiasm! A huge amount of work has gone into the creation of a plan for three key areas of improvement. The main project is the construction of a sympathetically designed annexe behind the church (virtually invisible from the church path). This will provide for a new, secure vestry, storage facilities and, crucially, two lavatories. It will also for the first time enable step-free wheelchair access to the church. 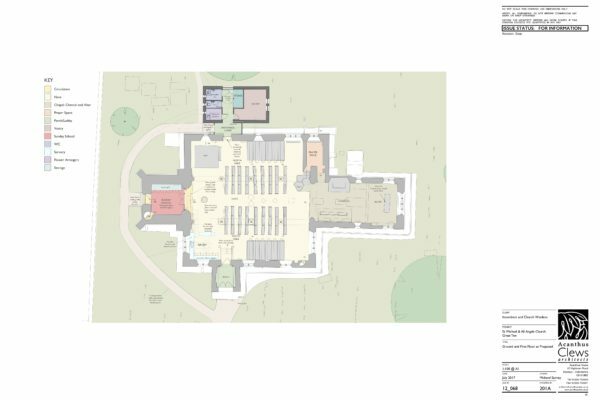 Within the church itself, it is proposed that the font be moved to the centre of the aisle and, in its place, a servery will be constructed that will hugely improve the quality and ease of post-service / concert catering. Having to bring water and other necessities to the church down the path is extremely laborious. Finally, it is proposed to create a mezzanine floor in the bell tower such that the bells will be rung from the upper level and the lower level will be enclosed in glass to create a more comfortable and noise-insulated space for Sunday school. We hope you will all agree that these proposed works will only enhance what is already a beautiful building. Crucially, by design, the all-important fabric of the church building will barely be disturbed. Even the annexe will only be connected to the outer walls of the church by glass panels. The cost is estimated at a substantial but manageable £400,000. We are delighted to say that due to the generosity of Nicholas Johnston and the Great Tew Estate, the amount we actually need to raise will be substantially less. The aim of this project, ultimately, is not so much about physical buildings, but about a legacy for the future. This church is the spiritual hub for the village, the school and surrounding areas, but is also something that inspires wonder in visitors from all corners of the globe. Our aim is to make it an even more attractive and comfortable amenity for the congregation as well as concert and wedding-goers and all other visitors. This will help us to grow the church family and create an even more vibrant place of worship fit for the 21st Century and beyond.